As I shuffled the cards to select this week's Intuitive Tuesday tarot card, I said, "Tell me what messages I need to bring to my readers this week." 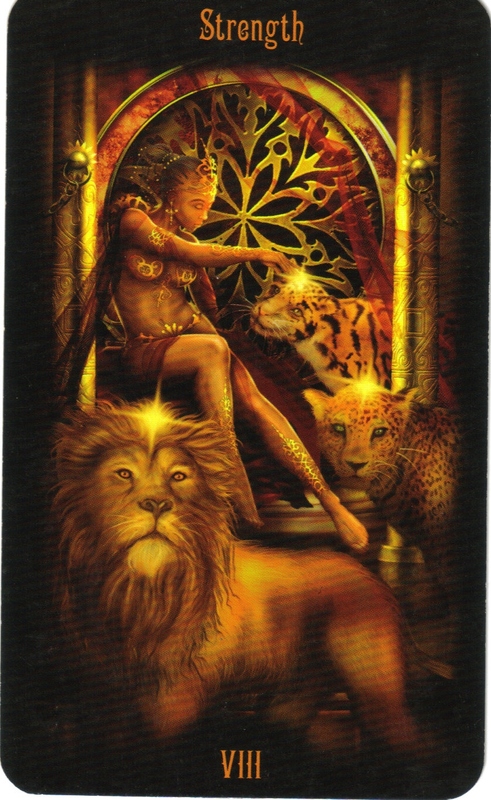 I selected The Strength Card from the Gateway to the Divine Tarot deck by Ciro Marchetti. I recently selected The Strength card. Click here to read my previous post. It's easy for me to think, "Since I've already selected this card, I'll pull another." But with only 78 cards in the deck, even though I double the outcomes by reading in both the reversed and upright positions, I'm bound to pull the same card more than once. Plus, there are subtle nuances that come up each time I interpret the energy of the card. It has to do with what's going on in my life and my own personal development. The previous posts on The Strength card (here and here), describe much of its powerful energy. I'd like to add in a few more insights today based on what YOU see and intuitively feel when you look at this card. Here are a couple of ways you may interpret the meaning of The Strength card. When you look at The Strength card, what comes to mind? Do you sigh with relief thinking, "Strength. That's just what I need right now as I face this situation?" Have you been struggling possibly with a health issue and, in seeing this card, breathe in the energy of The Strength card to help you find healing, rest and rejuvenation? Have you been resisting something (perhaps related to breaking old habits or creating new habits as part of your New Years resolutions) and feel more powerful or hopeful as you continue face this struggle? Do you know that you must make a decision and may even know what you need to do, but resist making a change for some reason? If you answered YES to any of these questions or have an idea in which area you need strength, The Strength card is here to assist and support you. By pulling this card today, know that you have SO much more energy than you think. It's a matter of tuning in and grounding yourself to hear the intuitive messages coming your way. And if tuning in and grounding feels foreign to you, simply breathe in deeply and ask for courage and faith as you move forward. It is all in (perfect) order whether we realize it or not. The Strength card is a great way to bring in the New Year! May you find peace and Strength as you move forward on your path. Ah, thank you, Sheri! This one is exactly what I needed to hear today. I'm feeling pretty strong right now. In fact, I'm wanting to share my strength with someone I love who really needs it right now. She (the person) is usually the strong one and she's always there for me. I'm asking to know what to give her. Strength is something a need a little extra of right now. Perfect Moment Monday -- Going "Viral"